I wanted to reach out to all of you to provide a recommendation for a motivational speaker we had visit us at East Hampton Middle School a few weeks ago. His name is David Flood. Here is his website https://davidjflood.com/. David was excellent! He was the shot in the arm our PBIS program needed. He moved not only the students but the staff as well. His mix of humor and real life experiences make his stories resonate with people. Since his departure that afternoon, his message has remained strong. I have not seen a student sitting alone at lunch for over two weeks! A new student to district, was embraced and welcomed as soon as he entered the door. Staff dealing with students making poor choices seem to have a different and more compassionate angle to their approach. I can honestly say his presence and challenge to the students was clear, concise and impactful. What set Mr. Flood apart from other speakers, was his investment of time after his presentation. Mr. Flood stayed for the entire school day attending lunch waves visiting with classrooms and discussing his message with students. If you are in the market for a fantastic speaker with a great message for teenage boys and girls, I encourage you to contact Mr. Flood. If you have any questions for me feel free to call or email. About four weeks ago I attended your talk at Fairfield Ludlowe Middle School. At first, I was annoyed at my mother for bringing me, I thought it was going to be a waste of my time that any 19 year old would have better enjoyed out with his friends. However, once you began speaking I could have sat and listened for days. The things you said were pretty eye opening to me and since then I have been grateful that I attended and have been thanking my mother ever since. Since your talk I have been doing my best to build up my bank of kindness, not using ground zero as a starting point, but rather the level of respect and kindness that had been normal to me previous to now. Thanks to this conscious effort to go above and beyond to make others happy and benefit those around me, I have felt noticeably happier, less worried and anxious, and more satisfied with myself. Whenever I am feeling down I am able to think about the positive impact I had on someone that day, whether it was simply chatting up the staff at Dunkin Donuts about how they were doing while they made my drink, staying late into the night at work to help someone who was alone and cramming to prepare material for a meeting, or just holding the door while a mother corralled her children out of a store. Thanks for helping me realize quite possibly the easiest way to boost my self-confidence and happiness in a totally unselfish and awesome way that lets me benefit others just as much as it does myself. I hope you come back to Fairfield (or Fairfield County) again soon so I can hear more of what you have to say. You are an awesome speaker and I’m glad I got to hear your talk. 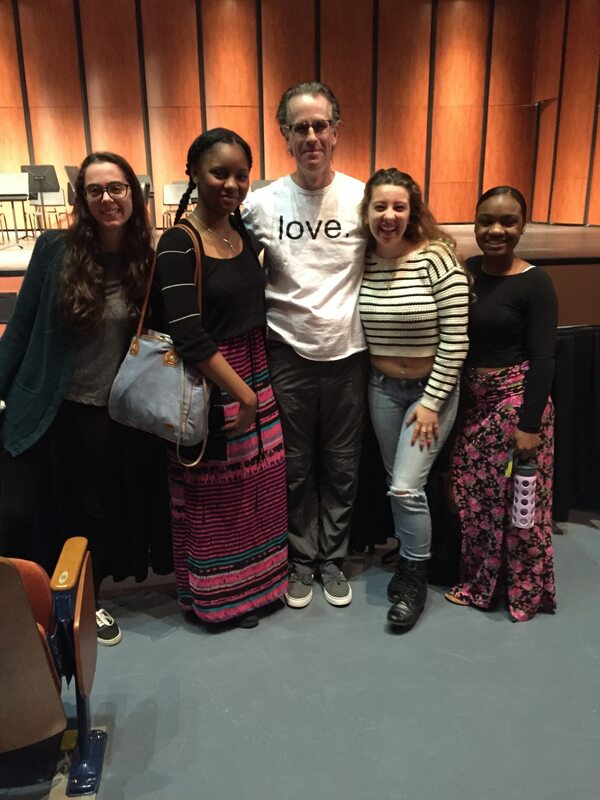 David Flood created a rapport with all of our students from the moment he stepped in the door. From the popular students to those with substance abuse issues to our special needs students, David made time to speak with our students before and after his dicussion, staying for hours after to speak with students. it was refreshing to have a speaker come in that didn’t just show up and collect their check. David doesn’t approach the students as a lecturer. He both laughs and cries during his talk and through his stories, we as a school community followed the same emotional roller coaster. Our students were so impressed, they all wanted David to come back. As a staff, we have already discussed his return. Well worth the investment. David takes as long as needed, spending time in the school, talking openly and informally with students he walks by. He has already changed the lives of many of our students. I personally watched him help 5 students individually with their struggles at home. And that was during his informal walks. Imagine what his discussion is like. Thanks again David. Plan to book with us again soon. Three Village students and staff blanked the community in a sea of orange and blue in support of Unity Day, a national movement designed to stomp out bullying and unite individuals in kindness, acceptance and inclusion. R.C. Murphy Junior High School hosted youth motivational speaker David Flood, who spoke to each grade level about the importance showing others dignity, respect and compassion. He punctuated his message by making direct connections to his personal life as he challenged the student to: look beyond the exterior appearance to see what lies within people, give thanks to the adults in their lives that support them and help ensure that no one sits alone at lunch. 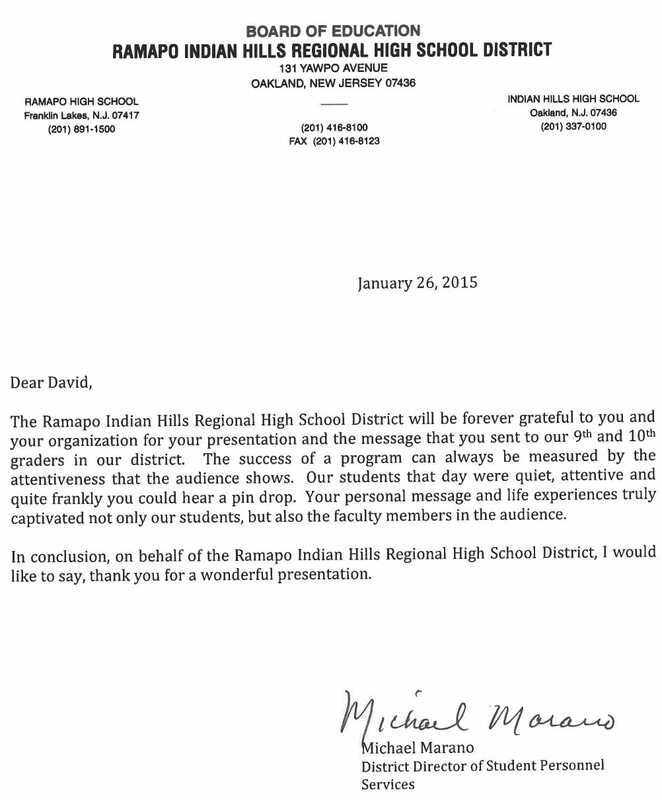 I am writing this letter of recommendation for David J. 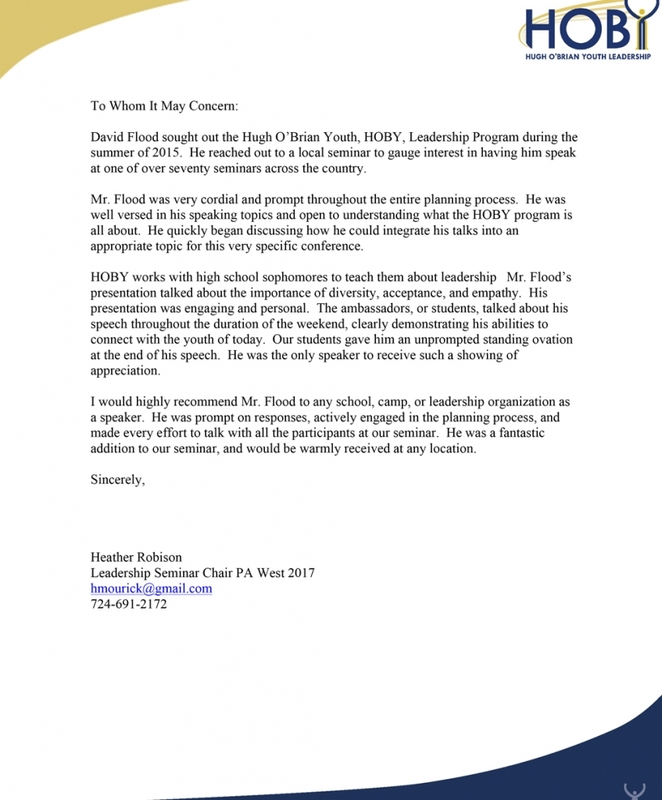 Flood, who has worked with our 6th, 7th, and 8th graders here at Northport Middle School for two years as a youth speaker and motivator. He is funny and engaging and well received by the students and staff. Mr. Flood’s assembly, “We’re All Alike,” serves as an emotional call to action for our students, and highlights empathy, kindness, and personal responsibility. As part of his assembly program he also visits our classrooms to facilitate small-group discussions to draw on student experience while they were fulfilling the challenges he presented during the assembly. Mr. Flood also leads a workshop on diversity entitled “A Look Inside,” which supports our DASA initiative of creating a proactive emotional literacy program. I highly recommend Mr. Flood to any school that is looking to enhance their social-emotional learning program. Please feel free to call me at 631-262-6750 if you have any questions about Mr. Flood’s programs. You are simply amazing. Your stories touched my heart. I know now that my actions and words truly make a difference. I can relate to you as well because my sister was very sick as a child and we had to fight to help her to get well. You are brave, funny, skilled, helpful, loving and you are you! In an effort to spread a message of kindness, Port Jefferson Middle School and Earl L. Vandermeulen High School recently welcomed motivational speaker David Flood. “It is important to provide our students with a consistent message through multiple sources, in order to reinforce what we are teaching them in school,” said Middle School Principal Antonio Santana. Photo courtesy of the Port Jefferson School District: Motivational speaker David Flood spent time during lunch with students at Port Jefferson Middle School following an assembly program focused on dignity and respect. 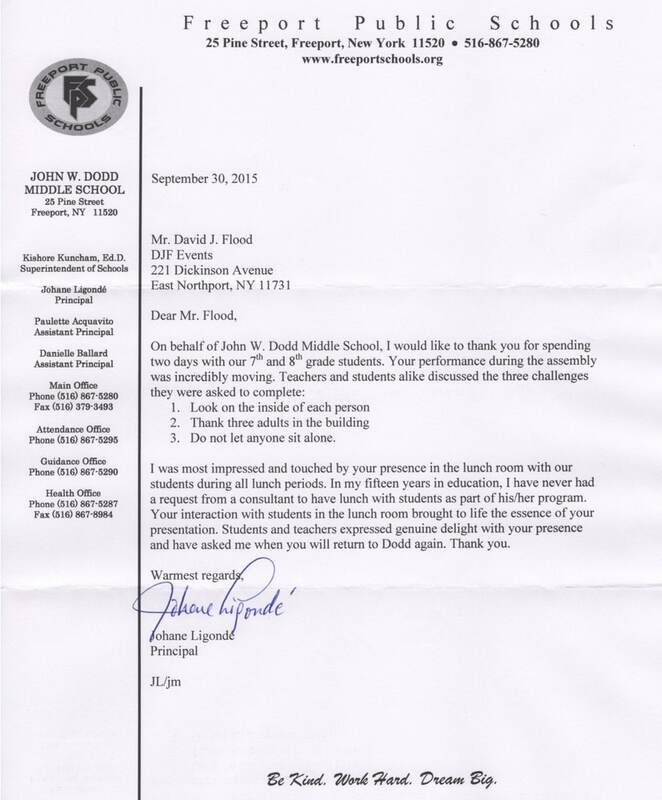 This letter of recommendation is for David Flood of DJF Events who presented a character education assembly to our middle school students on September 23, 2014. Working with Mr. Flood was a pleasure from start to finish. His presentation was filled with heartfelt stories which captivated his audience…a challenge in this day and age to do that without a lot of props or bells and whistles. He challenged the students with three tasks…thank an adult, invite someone to your lunch table, and treat others with respect. He remained throughout the day to attend the lunch periods and float in the hallways to reinforce his message. 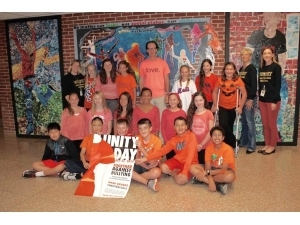 The students rose to the challenge and his message fits well with our message of being “Upstanders” to bullying. In closing, I would recommend Mr. Flood to other school districts to include as part of their assembly program without any reservations. His story and personality is well suited to working with students of all ages an backgrounds. please fell free to call me as a reference if needed. I just wanted to tell you how much I enjoyed meeting you today and your assembly was awesome! Hi Mr. Flood. I don’t know if you remember me but I’m the kid that was wearing all the puma clothes and my name was Alex. I just wanted to say again you really touched my heart and you are a very inspiring man to your children and everyone in that room. I just wanted to say thank you as part of my challenge because I consider you as a really awesome teacher. I am the one on one aide that spoke to you this afternoon. I had to take the time to thank you, not only for the inspirational talk, but for the “Thank You” you gave me. I love my job more then you could imagine! I pray every day that I have impacted my students life as much as he has mine. It has been a tough road for him, but I don’t have to tell you, but he is doing great! As you spoke, I felt your emotions. I hope the kids today take away the message you were trying to get across to them! I can only say ,Justin is lucky to have you!, and you him!! Hi Mr.Flood thank you for coming to awms. You have inspired me to help others even more.I told my whole family about you. Anyway I just wanted to say thanks. Dear Mr. Flood, Your speech was perhaps the most influential one that I have ever heard. We have a lot of speakers who come to our school but none of them spoke like you. It was so easy to listen to your speech and you moved me to take action and treat those around me with more dignity and respect. You have inspired everyone in our school to become better people. Thank you for visiting our school. David Flood, a youth inspirational speaker, gave two assemblies at the Middle School on September 23 as part of their DASA and character education pro- grams. 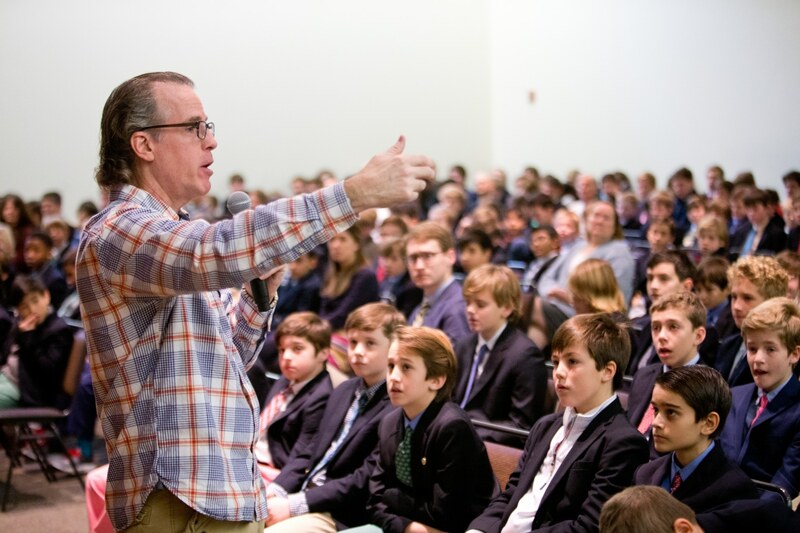 Thanks to the funding by the PTO, he addressed students in grades 5-8 and challenged them with three tasks – Think of others as yourself and find similarities, thank an adult in the school for all they do, and invite someone to your lunch table so that no student eats alone in the cafeteria. 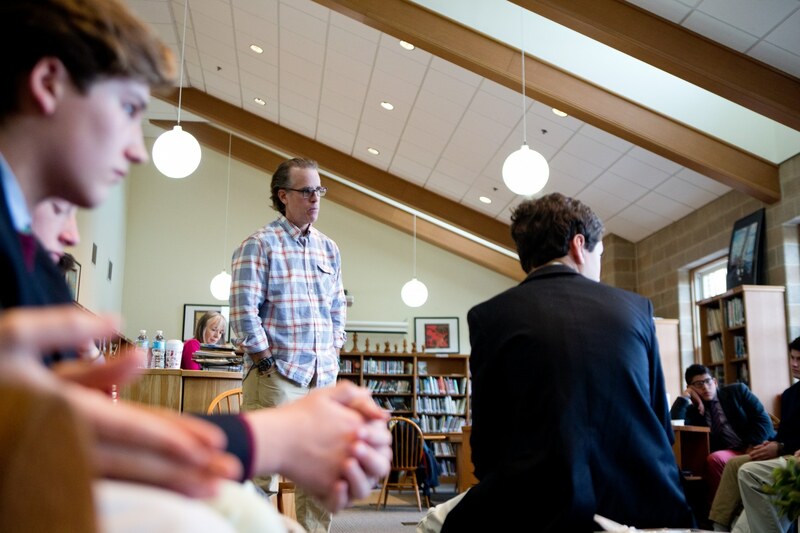 The personal stories he shared with stu- dents and staff were both humorous and poignant. He remained in the building to speak to students during the lunch periods in order to make connections and further his message. Hi David, I wanted to thank you for bringing such a beautiful message with you today to share with our students and staff. As you spoke, I observed the faces of my students light up, realizing that they were making personal connections to what you were saying. What a priceless feeling! You have a wonderful gift and your passion for what you do is so clear. You are a true inspiration. How refreshing to know that there are people like you in this world that make life changing impacts on the people around them. I can’t thank you enough for visiting us in our room and getting to know us today. As I am sure you noticed, we have a group of pretty incredible students with lots of love and personality to share! Our purple rose among our thorns was truly grateful to have had the opportunity to meet you. We will never forget it! I have attached some photos for you so you can see for yourself what a wonderful connection you had with the kids. Thank you, David! I wish you and your family all the very best in the future!